It truly was worth the wait. Who would have guessed that such a twisted and hulking fray of beauty would flow out of something so utterly complex and downright scary. Luc Lemay has surrounded himself with technically amazing players and taken 10 years to nurture the Gorguts name and overall vision for this moment. 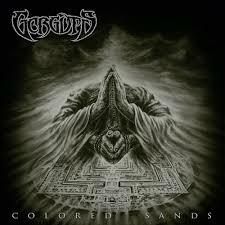 Colored Sands is 9 blistering songs that evade stagnation and somehow paint a bleak landscape of mystery and suffering through mind bending riffs that boil out of the speakers like rabid mathematics. Typically, the technical side of death metal is lost on me, for a bands desire to walk us through a demonstration of how much they have practiced their instruments over the years may be aesthetically impressive, but often produces music that is largely lifeless. Thankfully, Colored Sands breaks the circle with a bold showing of emotion and creativity. Rhythmically complicated beyond most of the things you have heard over the years, the songs contained herein beg for variety and dynamics to survive over the cardiovascular workout of precision blasts that often unnecessarily perplex albums such as this. Yes this element is on display as well, but percussion mastermind John Longstreth (Ex-Angel Corpse, Origin) allows these songs to breath and sometimes what he doesn’t play produces just as much of an impact as what he does. Luc’s composition has become truly awe-inspiring. Every song on this album is a bizarre journey into the dark and never once did I have a clue as to where I was going. Such a listening experience is endlessly enjoyable for me as countless years of hearing the same old formula reheated and repackaged tends to wear on the most devoted and stubborn of metal connoisseurs. The complexity of this material stretches through every element of Colored Sands, but through waves of disjointed rhythms, there is form and strange hooks that offer inspired recurring segments of music for the listener to comprehend and be led to believe that they are a part of the whole experience. Led to believe? Yes. There are forces at work beneath the surface here that I’m not sure I could ever understand and my time with this album sometimes feels like one of the ugliest nightmares you have ever experienced, but you want to subject yourself to the horror just to see how the end presents itself. Where the fast parts found in tracks like Forgotten Arrows and Reduced to Silence are impressive if not fleeting, the crawling and disjointed… dare I say “doom” side of this opus is the main tempo of perversion and it creates a dark underbelly far more wretched than could ever hope to be produced by the death and black metal world at large. Luc’s desperate death moans are the constant artifact for you to cling to while the hammering motion of songs like the title track and Enemies of Compassion bludgeon with malice. How the riffs can sound so utterly bleak (made even more so by a crisp, distorted, and audible bass tone), only to take flight with endlessly innovative and beautiful harmonies continues to amaze and keep me wanting this album over and over again to unlock even more levels that were missed previously. ~ by martyworm on July 10, 2013. I can’t wait for this one. I’ve heard two tracks so far, this one and An Ocean Of Wisdom and really like both. Unfortunately I have to wait until early September until the album is released. This entry was posted on July 10, 2013 at 7:30 pm and is filed under ALL REVIEWS, G-reviews.You can follow any responses to this entry through the RSS 2.0 feed.You can leave a response, or trackback from your own site.